Terrapin Peak Bed, Breakfast & Beyond provides Oklahoma lodging just 2 miles off the Cherokee Hills National Byway (Highway 82/100), perched on a foothill of the Ozark Mountains 850 feet above sea level, in the woods near Lake Tenkiller (2 miles from the lake) in Cookson, OK.
Terrapin Peak accommodates up to 14 guests in three luxurious cabins – Cozy Turtle, Scenic Turtle and Snappy Turtle – a private distance from the Main House and each other. Cozy Turtle Cabin features a 10-foot wide wrap-around covered deck, full kitchen and with all the conveniences of home, two private bedrooms and is perfect for extended stay reservations for up to 4 people. Scenic Turtle Cabin features two covered decks with terrific views with two over-sized rooms each with their own bathrooms offering plenty of private space for up to six people. Snappy Turtle Cabin, perfect for honeymooners and couples celebrating a special occasion comprises larger rooms, bathrooms with two-person whirlpool tubs / shower combo and private covered deck with porch swing. The “lodge-style” Main House, the Terrapin Peak Lodge was built in 2007 and features knotty pine wood ceiling and trim, rich colors and plenty of windows for viewing wildlife across nine acres of groomed mountaintop beauty. 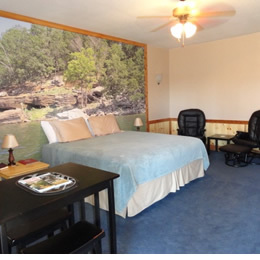 If you are looking for contemporary, rustic, secluded, charming and clean Tenkiller lodging accommodations near the lake, then this is the place. 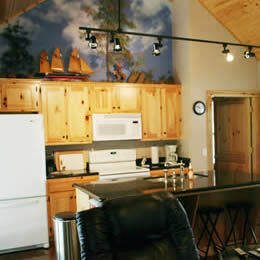 Want to check out how our cabins and rooms compare? See our handy room comparison here. 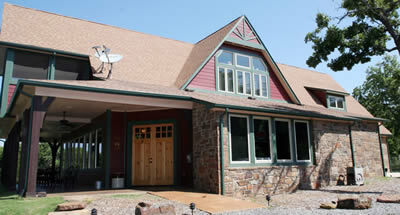 Our bed and breakfast in Oklahoma accommodates up to 14 guests. There are various room sizes (one connected to a full Kitchen/Great Room), bed combinations and price ranges. These lodging accommodations include six guestrooms with private bathrooms in three luxurious cabins a private distance from the Main House and each other. 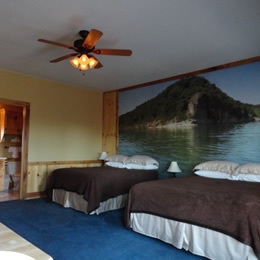 Rooms range in price from $159 to $189 (single or double occupancy) depending on room selection. Continental Breakfast selections are included in the price of the room. Hot meals (breakfast or dinner) are not part of your room rate but are available. 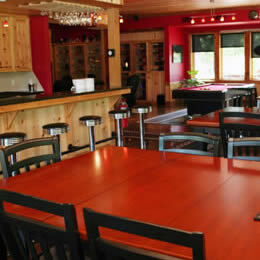 Let us know two weeks in advance about your dining needs and our Chef will skillfully prepare your selections. See Breakfast or Dinner menu for detailed information. There is a two-night minimum from May 1 through September 30 (except holidays noted). There is a three-night minimum for Memorial Day, July 4th and Labor Day holidays. Reservations should be made two weeks in advance, but last-minute reservations are possible. Check availability by clicking here. Detailed information about deposit requirements, payment options and check-in/out times is located on the Policies page.